Shop these products before they are sold out (again). Check out co-founder, Vanessa Morrison, being featured in the Black and Urban blog highlighting her research on barbershops as community spaces. Introducing Rooted’s new Mahogany + Spice Beard Butters. Keeping your beards freshly hydrated with natural, local and earthy fragrant ingredients. Compliments well with our Beard Bar soap. Both available now at the shop. Show us your beard game with #rootedclub on social for a chance to win some Rooted gear. We are now on the Emfluencer app. Download the app and subscribe to be the first to know about the hook ups. Give your beard the Rooted treatment with our new hydrating + cleansing Beard Bars. Scents in Ivory and Mahogany. Hand crafted. Locally made. 100% natural ingredients. 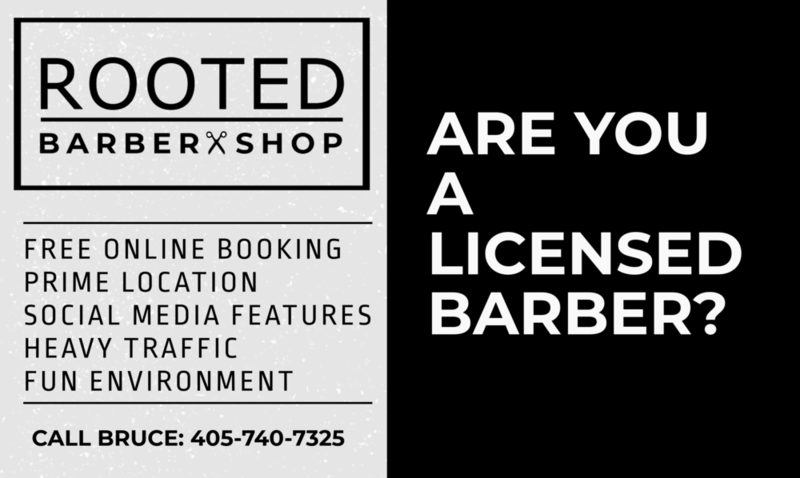 Learn more about the great community work that our Director and En Root Mobile Barbershop Company’s co-founder, Vanessa Morrison, is up to on the OU Christopher C. Gibbs College’s blog. We couldn’t be more proud. Thank you to all of our clients, collaborators, neighbors, friends, and barbers for an amazing first month in business. In our first month we saw 315 returning and new client appointments who we've already made some amazing memories with in our new space together. That number is not even including all of our wonderful new walk-ins from the neighborhood. 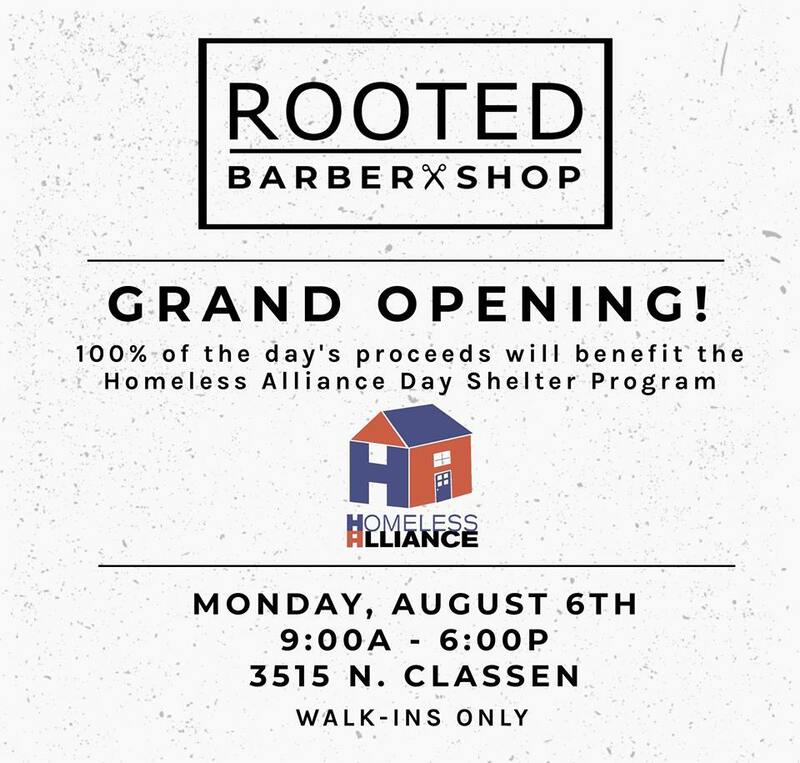 We raised $700 for The Homeless Alliance on our first day in collaboration with the The Hair Cafe Cosmetology & Barber College and you all coming out for cuts to make that happen. We have designed Oklahoma's first barbershop Artist is Residence program and are honored to have Rico Young as our first artist. Bigger plans are coming and we are excited to have his new solo exhibit this fall. "Cuts and Culture" is our aim and we are intentional about elevating the barbershop space to be more than a place you get your haircut. Thank you all for trying it out and experiencing this new concept with us. 1 month down and many more to go. We are grateful for all of our clients and friends! Each quarter Rooted will host a local artist in residence. This program was designed to provide a platform for local artists to do solo showcases and for the community to experience it. Rooted’s first artist is none other than local sketch artist, Rico Young of Young Portraits/ Rico's Art. Learn more about Rico here and be on the look out for his spotlight event coming in October.